Here are the 6 most unique chopsticks ever made. Each in their own way is a rare work of art to be cherished and appreciated for the beauty and happiness they brought to our world. It's a fact of life that nothing lasts forever. Such is the case with some of the most unique chopsticks ever made. So warning: some of them are no longer available today... but some are! To make these happen was a labor of love. At our local market we would see the most beautiful works of art made of colorful glass and wondered if that same amazing craft could be replicated in a pair of chopsticks. One glassmaker would refer us to the next, who'd refer us to another and another, until we found Jim. Jim was this small, somewhat elderly gent with a quirky personality who was an expert in glass. He knew exactly what types of glass were needed to make it work and set out to perfect a design. Unfortunately Jim was in his final years of laboring before seeking the retired life, so our run of carrying these exquisite glass chopsticks was short lived. Fun while it lasted. The search for exotic chopstick materials lead us to carbon fiber. Our first carbon fiber chopsticks were made of carbon fiber rod with rings of aluminum decoration. They were underwhelming in their appearance but were popular for being unique. Then we found another maker. They used the more traditional woven carbon fiber, polished and coated with a clear finish. Wow. They embodied the technical coolness of a formula one race car in a stick. And they were expensive - $150 for a pair with a matching rest. Unfortunately the small shop just up and disappeared and we've never been able to locate them since. Bummer. For a few years we had access to a local craftsperson who had the patience to hand make chopsticks. 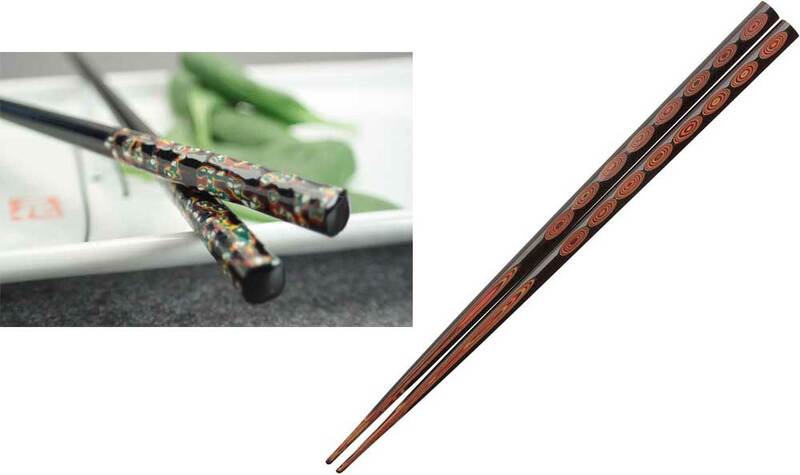 During this time we were able to have him make for us the most fabulous acrylic chopsticks, with bold swirls of translucent colors and pearlescent. They were truly unique in their beauty and style. 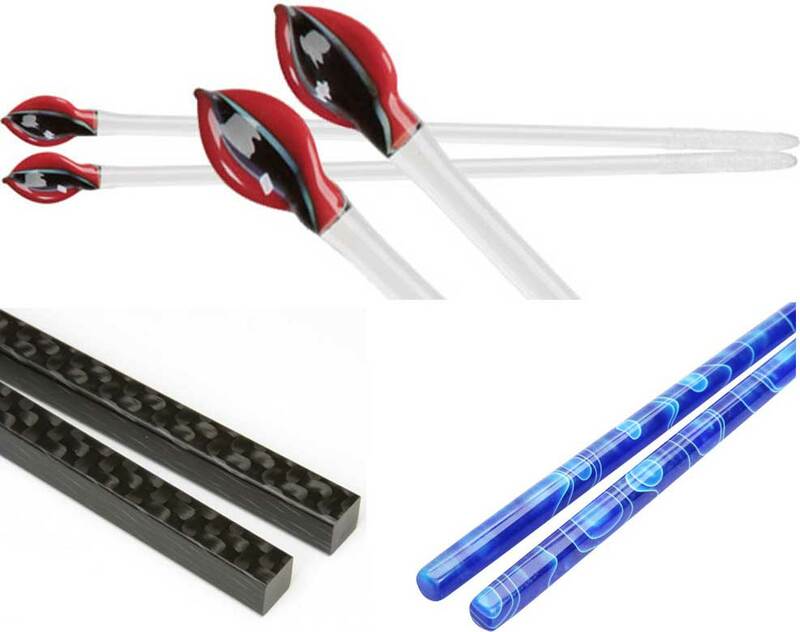 The galactic sci-fi appeal of Star Wars has been personified in chopsticks. What's more, you can now even get light-up versions, perfect for when the power goes out at dinner time and you need to see where your food is located on the plate. 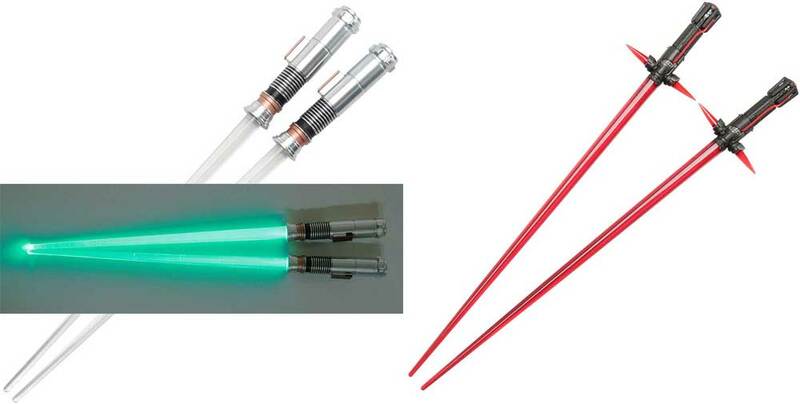 And these aren't just generic lightsabers, we've had the classic Luke Skywalker, Darth Vader and Yoda lightsabers, and now we have Kylo Ren and Rey lightsaber chopsticks. Another less-serious but still unique chopstick are the samurai sword chopsticks. What makes them so special is the very finely detailed modeling of the hilt and handle, replicating the colors and style of a specific historically famous samurai. Wakasa chopsticks are arguably some of the most uniquely beautiful chopsticks in the world. A hundred years ago there were more than 150 family chopstick makers in Obama, Japan, a little city of 32,000 people located on the beautiful Wakasa bay. Today there are only nine remaining, as younger generations no longer pursue the family business. Each family developed their own styles, making designs completely from natural materials, that embody scenes of the ocean floor as seen through the clear waters of Wakasa bay, hence the name Wakasa chopsticks. Materials such as sea shells, pine needles, egg shell, and natural lacquers are used to make unique designs from serene to flamboyant. Because of the completely hand-made nature and slow curing time of natural lacquer, a pair of chopsticks can take up to two months to produce. Do You Have Unique Chopsticks? Please show us your unique chopsticks. Send us a photo and description and we'll post it on our Facebook page.